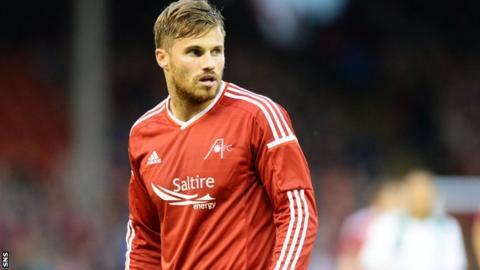 Aberdeen striker David Goodwillie has signed a new contract that will keep him at Pittodrie until the summer of 2016. The 25-year-old former Blackburn Rovers and Dundee United forward's deal was due to end in the summer. "It's a huge club, moving in the right direction under the manager," Goodwillie told the Aberdeen website. "I wanted to remain part of that as I feel something special can happen with this team." Boss Derek McInnes has guided Aberdeen to top spot in the Premiership table this season. Goodwillie has contributed five goals this term, after joining the club in the summer following his release by Blackburn Rovers. "I've really enjoyed my experience so far at Aberdeen and have particularly enjoyed working closely with the manager and Tony [Docherty, assistant manager]," added Goodwillie. "There are a great bunch of players here, alongside brilliant staff, who are all working towards delivering success for the fantastic supporters." Having made his name as a youngster at Dundee United, scoring 29 goals in more than 100 appearances, Goodwillie earned a £2m move to Blackburn in 2011. He failed to cement a first team place at Ewood Park, however, and joined Aberdeen after loan spells at Crystal Palace, Dundee United and Blackpool. Dons manager McInnes said: "We knew David would take time to get his game up to speed due to the timing of his arrival at the club, but now he has established himself his value to the team, both on and off the park, is immense and I'm delighted he has decided his future remains with us at Aberdeen." Goodwillie joins Ash Taylor, Niall McGinn, Jonny Hayes, Andrew Considine and Adam Rooney in committing his future to Aberdeen.